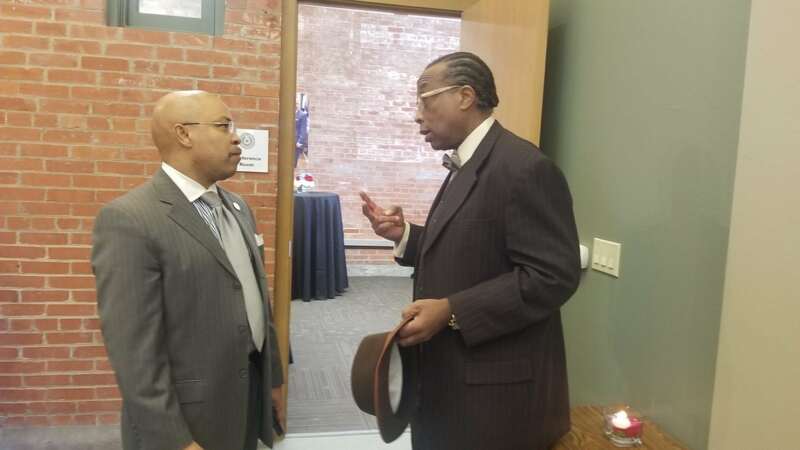 State Representative Carl Sherman and Dallas County Commissioner John Wiley Price. LANCASTER—Friday, State Representative Carl Sherman along with key area leaders celebrated the opening of his district office. The office is in the City of Lancaster Visitors Center and State Auxiliary Museum located at 103 North Dallas Avenue. Local politicians, school board trustees, school superintendents and campaign volunteers were in attendance. 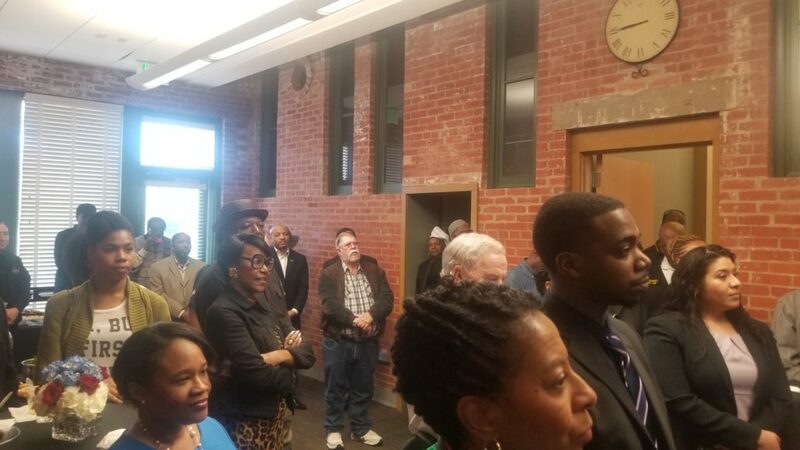 Attendees listen to remarks made by State Representative Carl Sherman Sr.
Dallas County Commissioner John Wiley Price was on hand to say a few words before heading to another engagement. Price went on to say that Rep. Sherman can only be as good as the people he surrounds himself with. 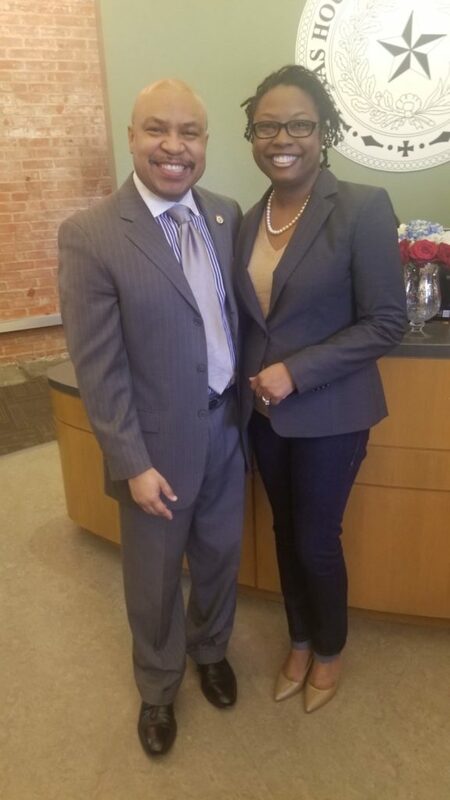 State Representative Carl Sherman and Lancaster City Councilmember Nina Morris. In September 2018, the Lancaster City Council approves Representative Sherman’s use of available space in the State Auxiliary Museum. The relocation of the District 109 office from DeSoto to Lancaster was one of Sherman’s first major decisions. Officials believe having a state representative in Lancaster will add visibility; as well as provide additional traffic to the community. Sherman said 10 factors stood out in making the final decision of where to office. These 10 factors included business and government environment, cost, quality of life in the community, transportation, the quality of site location, culture, accessibility, security, infrastructure and quality growth material. “So often I can be so focused that I am not really concerned about anything else, but just the goals that are before me,” Sherman said as he was concluding his thoughts Friday night. Even while he was enjoying the people he is meeting; he was still being aware of the issues. State Representative Sherman said he is excited about the new office location in Lancaster. His District Director will be available in the Lancaster office full time. “Lancaster is centrally located, and I think our future will be bright,” he concluded. Texas Legislative District 109 includes DeSoto, Cedar Hill, Glenn Heights, Hutchins, Lancaster, Wilmer, as well as parts of Duncanville and Dallas.